It is recognized that antibodies from the mother provide a level of protection to infants. This is why mothers are often advised to get vaccinated when they're pregnant. However, does the vaccine have to be given during pregnancy or would a vaccine taken as a child-teenager, if still effective as an adult, function the same way? I'll try to give an example to clarify. Suppose a person is fully vaccinated against Whooping Cough, at least based on the current schedule, but does not receive a pre-natal vaccination. Is it reasonable to suppose that if the vaccine is still effective and is causing the body to produce antibodies, that these maternal antibodies would be passed on such that the infant would still receive some protection that it would not receive had the mother not received the childhood vaccinations? Further Detail I am interested in this question because it could influence studies which look at rates of infection/cases in infants, in order to measure the effectiveness of cocooning. These studies assume that because these children are too young to be vaccinated, the vaccine cannot be influencing their susceptibility, except through cocooning. But if childhood vaccination results in a high enough IgG levels, that might not be the case, and so this result should be considered in such studies as this one. If a woman was vaccinated when she was a child, will she be able to provide passive immunity to her children? It depends on the vaccine. Generally, if the mother still has high levels of protective IgG during the third trimester (especially if it's type 1 or 4), those antibodies will cross the placenta and provide passive immunity to the newborn. In whooping cough, though, good levels of newborn IgG require vaccination in the third trimester. Immunizations are given to adult women prior to conception, while pregnant, and after delivery to protect the mother from infection, protect the fetus from infection, protect the fetus from congenital anomalies associated with maternal infection, and to protect the newborn from infection through passive immunity and through decreased exposure to infected contacts. The exact recommendations differ for different vaccines and different levels of maternal risk. From the same recommendation, you can see that some vaccines are recommended only if maternal antibody titers are negative and some are recommended regardless of maternal antibody titers or prior immunization. 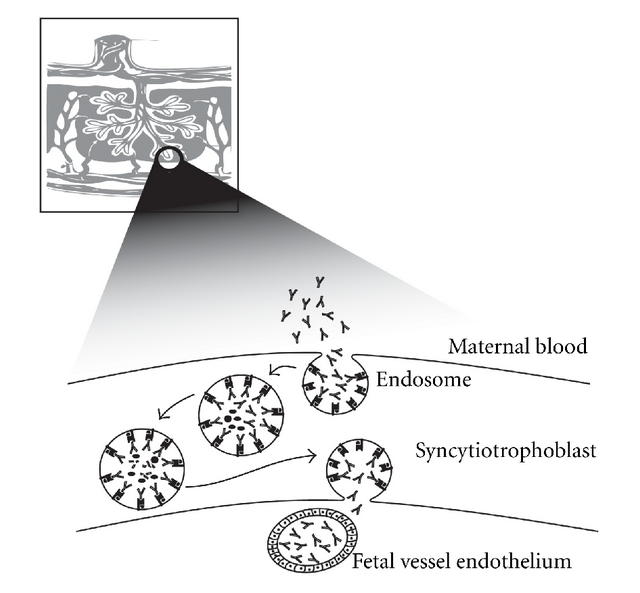 IgG undergoes active transport from the maternal circulation to the fetal circulation across the placenta. Newborn IgG levels correlate with maternal IgG levels (i.e., the active transport mechanism isn't saturated in most cases). This suggests that low IgG for a particular antigen in the mother will result in low IgG for that same antigen in the newborn. Antibody transport begins as early as week 14, but both the total transport and the rate of transport increases over the length of the pregnancy. This suggests an hypothetical optimum time for an intervention that would temporarily boost the level of any antibody. Whooping Cough, or pertussis, the illness caused by Bordetella pertussis, an encapsulated bacteria, is quite dangerous in the newborn. A few years ago recommendations for vaccination against pertussis were updated to immunization in the third trimester, regardless of the mothers prior immunization status. This recommendation is based, in part, on the understanding of transplacental transfer of IgG described in the article I linked in the earlier section, and in part on data on the association between timing of maternal immunization and fetal, all in the context of increased pertussis case rates. Shortly after these recommendations were updated, additional, more thorough data confirmed this recommendation, though it suggested a slightly narrower window for the ideal time of Tdap administration (from 27-36 weeks to 27-30 weeks). Passive immunity from antibodies transferred to the fetus during pregnancy declines pretty sharply after birth. By 8 months the maternal IgG contribution is effectively gone. This is passive immunity because only the products of B-cells (the antibodies) are transferred. Immunization of the child, on the other hand, provides active immunity, because they develop the capacity to produce their own antibodies. I'd refer you to the allergy and immunology chapter of Bernstein and Shelov's Pediatrics for Medical Students, a surprisingly good general reference. The (1996) drop was pronounced in infants too young to be vaccinated (Fig. 1A), itself a clear indication of herd immunity. This is incorrect. That figure represents the decrease in infection rates for infants under 1 year of age at the point when vaccine was re-introduced. This included infants who were vaccinated (at 3 and 5 months). The data before the re-introduction of vaccine, e.g., in 1995, though, does provide a good natural experiment for the epidemiology of pertussis in a non-immunized and immunization remote population. It had been 16 years since the use of whole-cell pertussis and you can clearly see the waning immunity in the population incidence as a whole. If you are really interested in digging into these questions, this cohort is a good place to start. Sweden is very good at collecting important data, so it may be out there. Vaccines do not cause anyone to make antibodies their whole life. Eventually, the antigen in the vaccine is cleared away, and the immune system stops reacting. But memory cells have been created, which are ready to quickly re-active the immune system if the antigen is encountered again. Think about it. Can you name any childhood diseases that are known to usually skip a generation? People lived for thousands and thousands of years with no vaccines, and everyone got every disease their mother got as a girl. Not the answer you're looking for? Browse other questions tagged microbiology immunology vaccination or ask your own question. Evidence for annual rabies vaccine? Can immunity to diseases vary by populations?